As the 2012 Olympics come to a conclusion this weekend, Google this week released four playable versions of its famous doodle, the company's logo on its minimalist front page. 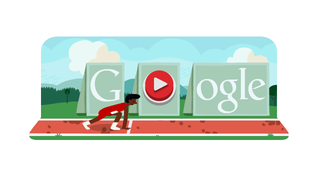 The doodles today returned to static illustrations of Olympic events, apparently ending the series of games. So I figured I'd give them all a good playthrough and score which ones took home a medal for fun, replayability, and timewastability, the three pillars of any good flash game. Here goes. Objective: Run a race using the left and right arrows; jump 10 hurdles with the space bar. Judging by his race posture, the athlete isn't so much "running" as he is "moseying," or "shambling." The alternating left-right key strikes make Hurdles 2012 reminiscent of The Activision Decathlon. But hurdling in Hurdles is tough because of the lag in recognizing the jump command (space bar) and the fact some hurdles don't appear to be evenly spaced (the second and third ones for sure.) At least it's not QWOP. Objective: Make as many baskets in a 24-second span using the space bar, which acts as a timing mechanism for the range of your shot. Your player will move further back from the basket as the clock winds down. Objective: Race a kayak though a water course using the up and down arrows (controlling your left and right paddling). Avoid rocks and make all the slalom gates. There seems to be no time penalty for missing the gates so Slalom Canoe encourages you to make them by giving your boat a boost if you do. The up/down paddling is hard to master . Your best bet is to go for slow precision and hit every gate or just bull through as fast as you can, trying to avoid the rocks. Objective: As a goalkeeper, stop as many shots from your opponent. The game is over when he makes three. Personal Best: 27 shots stopped. The game seems too easy at the beginning but it gets progressively harder, with faster shots and more unconventional angles and arcs. It's probably the longest-lasting gameplay experience of the bunch, but Basketball 2012 has the most replay value.